The PCT Mailing Label page provides an easy way to create mailing labels for many of the locations along the Pacific CrestTrail. Simply fill out the form below and select a location. A separate window will popup containing the completed mailing label. Print out the window and you've created your mailing label. The mailing labels are ideal for sending food, maps, guidebooks, gear, and bounce boxes to most locations along the trail. I've also included several links at the bottom of the page for planning, gear manufacturers, PCT journals and videos. 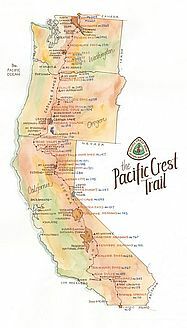 Just about anything pertaining to the Pacific Crest Trail can be found from this site. To create mailing labels: you only need to fill the form once. It will be used on any location you select. To print mailing labels: click on desired location, right-click on popup window, select print. After printing, you can select the next location without closing window. Two labels will fit on a single sheet of paper. If different from the return name. M-O-T — Miles off trail to town. Miles — Number of trail miles to the next trail town.